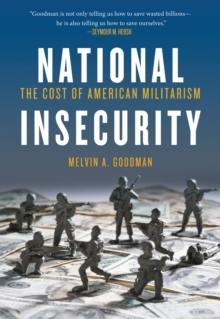 "Mel Goodman has spent the last few decades telling us what's gone wrong with American intelligence and the American military . . . he is also telling us how to save ourselves." --Seymour M.
Hersh, The New Yorker"Whistleblower at the CIA offers a fascinating glimpse into the secret, behind-the-scenes world of U.S. intelligence. Melvin A. Goodman's first-person account of the systematic manipulation of intelligence at the CIA underscores why whistleblowing is so important, and why the institutional obstacles to it are so intense. . . . At its core it's an invaluable historical expose, a testimony to integrity and conscience, and a call for the U.S. intelligence community to keep its top leaders in check. Urgent, timely, and deeply recommended." --Daniel Ellsberg"In this fascinating and candid account of his years as a senior CIA analyst, Mel Goodman shows how the worst enemies of high quality intelligence can come from our own midst, and how the politicization of intelligence estimates can cause more damage to American security than its professed enemies. 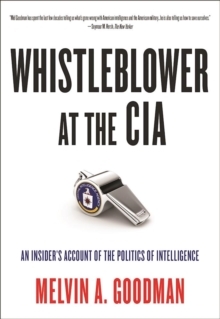 Whistleblower at the CIA is a must-read for anyone interested in the intricate web of intelligence-policymaking relations." --Uri Bar-Joseph, author of The Angel: The Egyptian Spy Who Saved Israel"Mel Goodman shines a critical whistleblower light into the dark recesses of the CIA as a former insider. His book serves in the public interest as a warning and wake-up call for what's at stake and why we cannot trust the CIA or the intelligence establishment to do the right thing. "-Thomas Drake, former NSA senior executive and whistleblower"Mel Goodman's Whistleblower at the CIA is not just an insider's look at politics at the highest levels of government. It's also a personal account of the political odyssey Goodman had to negotiate for telling the truth. The CIA likes for its employees to believe that everything is a shade of grey. But some things are black or white, right or wrong. Mel Goodman did what was right. He may have paid with his career, but he's on the right side of history. "-John Kiriakou, former CIA Counterterrorism Officer and former Senior Investigator, Senate Foreign Relations Committee"Mel Goodman's Whistleblower at the CIA confirmed for me what my own experience had revealed during six hectic days and seven sleepless nights at CIA headquarters, getting Colin Powell ready for his presentation to the UN Security Council on Iraq's 'Failure to Disarm' on February 5, 2003. Mr. Goodman provided exhaustive detail on why the agency has failed, again and again, and will continue to fail if some future president and congress do not step in and dramatically change the way CIA functions. "-Lawrence Wilkerson, former chief of staff to secretary of state Colin Powell"A refreshingly honest, well-sourced expose of the CIA that not only furnishes the author's compelling personal story of standing up to inflated estimates sprinkled with little-known but historically significant details of the jewels and the warts, the successes and failures of decades of U.S. intelligence analysis. Especially instructive to our current era plagued by faulty group-think and the 'war on whistleblowers,' the book chronicles how 'contrarian' analysts are often 'the best source for premonitory intelligence.' This book is a must-read not only for political historians and American citizens wanting to know the unvarnished and often surprising truth about the intelligence side of the CIA but for all students contemplating a career with the CIA or other intelligence agency. "-Coleen Rowley, retired FBI agentMelvin Goodman's long career as a respected intelligence analyst at the CIA, specializing in US/Soviet relations, ended abruptly. In 1990, after twenty-four years of service, Goodman resigned when he could no longer tolerate the corruption he witnessed at the highest levels of the Agency. In 1991 he went public, blowing the whistle on top-level officials and leading the opposition against the appointment of Robert Gates as CIA director. In the widely covered Senate hearings, Goodman charged that Gates and others had subverted "the process and the ethics of intelligence" by deliberately misinforming the White House about major world events and covert operations. In this breathtaking expose, Goodman tells the whole story. Retracing his career with the Central Intelligence Agency, he presents a rare insider's account of the inner workings of America's intelligence community, and the corruption, intimidation, and misinformation that lead to disastrous foreign interventions. An invaluable and historic look into one of the most secretive and influential agencies of US government--and a wake-up call for the need to reform its practices. Melvin A. Goodman served as a senior analyst and Division Chief at the CIA from 1966 to 1990. His writing has appeared in the New York Times, Washington Post, Harper's, and many others. He is author of six books on US intelligence and international security.